The Amtrak train service currently goes from Miami to West Palm Beach and then swings to the middle of the state as it goes north along the CSX tracks to Orlando/Tampa. Amtrak would like to switch over to the FEC tracks in West Palm Beach and go straight up the east coast of Florida to Jacksonville along those FEC tracks. This was a topic of discussion at the June 15th West Palm Beach City Commission meeting, because one of the agenda items was the city's approval of a wider initiative to include this change as part of a Florida project which gets selected as part of the federal stimulus package. If approved, this could mean a fast-tracking for this project which could potentially make it happen within a year or two rather than decades. This could be both exciting and potentially disturbing for West Palm Beach. This would expand available train service and pave the way for further expansions in the future. However, no one wants the cross-over between the CSX and FEC tracks in their neighborhood. At the City Commission meeting there seemed to be a lot of confusion about the train tracks, because this new project was confused with an existing proposal to have a local passenger rail on the FEC tracks (but that proposal involves the span between Miami and West Palm Beach, not the span between West Palm Beach and Jacksonville). Neverthless, both projects could use that all-important cross-over between the FEC and CSX tracks. And that cross-over almost must occur somewhere in the West Palm Beach area, because West Palm Beach is the only place where the FEC and CXS tracks are only blocks away from each other. The previous proposal had involved significant discussion regarding a location of that cross-over on Evernia Street, essentially 1 block from Clematis Street, cutting right through the middle of downtown West Palm Beach and breaking the small downtown West Palm Beach in two right down the middle. This idea was vigorously opposed by the budding Downtown Neighborhood Association and ultimately vigorously opposed by the West Palm Beach City Commission, so the transportation authorities involved changed their focus. At the June 2009 meeting where the new Amtrak proposal was discussed, the transportation official present was asked whether the Evernia Street crossover was still under consideration. He appeared to answer "No" and he explained that the current discussions centered around an area near 25th Street in West Palm Beach, 25 blocks to the north of the central downtown area. Commissioner Robinson, whose district I believe includes this area, did not object in principle, although he wanted to ensure it would not run through a well-known cemetery in the area, and the transportation official assured him it would not. So, these things seem to be in a state of flux, but at least the current discussion appears to be focused on the 25th Street location and not the central downtown near Clematis Street. As long as an acceptable place (which does not harm any residential areas) can be found for this crossover, it actually could be a great boon for this area in making West Palm Beach a central transportation hub for the entire state of Florida. May 1 2010 Update. In a very exciting development, Amtrak did a test run of their train with passengers today from Miami to Jacksonville along the FEC tracks. There has not been passenger service on this track since 1968. The train stopped this morning just north of Clematis Street off Quadrille, and various officials who went along for the ride got out to talk with reporters. Although plans are not set yet, Amtrak seems very serious about this project, primarily the creation of service on the FEC track which goes straight up the east coast of Florida from West Palm Beach to Jacksonville. Apparently, another application is being submitted for federal stimulus dollars for the project, to be submitted in July and responded to hopefully by September. A lot of planning has been done for a crossover near N. 25th Street in West Palm Beach, if this project does get the funding and does move forward over the next few years. Below is a picture of the Amtrak train parked in downtown West Palm Beach this morning on the FEC tracks (a strange sight since these tracks only carry cargo trains at this time). 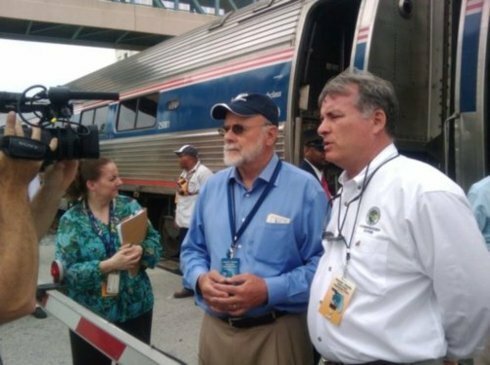 The two people pictured are Tom Carper, President of Amtrak's Board of Directors (and former U.S. Senator from Delaware) and Jeff Koons, the Palm Beach County Commissioner who has been very active with these transportation initiatives.